- As delicate and beautiful as springtime. Marquis-shaped synthetic onyx gemstone nestles between a pair of Celtic knots. Ring is only 1/4" across at its widest point. Made of sterling silver. Available in whole sizes only. 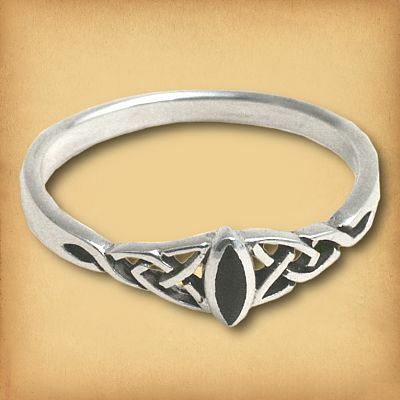 Do you have any other questions about our Silver Dainty Celtic Onyx Ring? I love my new ring. It's the perfect size for my small fingers. The craftsmanship is beautiful. The packaging was more than I expected. Your follow up is gratefully appreciated. I am pretty picky about what rings I will wear. it is so beautiful and onyx is a favorite of mine so I adore wearing this. I pretty much just want to buy all of their rings because they are simple yet demand attention. Shipping was quick as always. 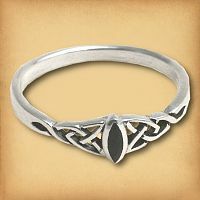 I love gryphon moon, would recommend them to anyone and do all of my Pagan jewelry shopping here. pinkie ring. I love it! This is a beautiful ring perfect for smaller hands! I have very petite hands and a lot of rings look clunky or awkward on my fingers. 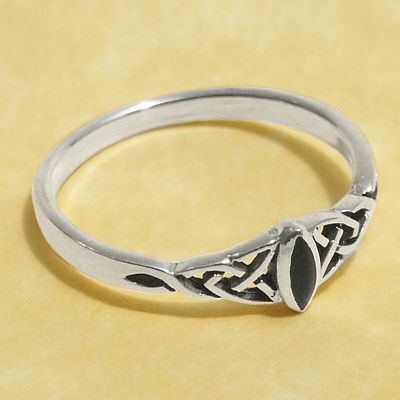 This delicate ring is well made and looks great on a petite hand. I have received many compliments on this dainty ring. You won't be disappointed! I cannot find silver rings that don't turn my finger colors, UNTIL now!!! I love the ring I bought from you and plan to purchase new wedding bands soon for my husband and I, and YOU'LL be where I come to for ordering those as well!!! I have a hard time finding rings for my daughter who has very small hands for an adult a size 5 fits her thumb. Gryphon's Moon has some beautiful rings and some very small sizes. She loved the ring.